St. Louis Actors’ Studio is known for producing challenging plays, and their latest offering is certainly in that vein. Just reading the plot description for Blackbird gives me the creeps, and the program has a warning regarding its subject matter. This is not an easy play to watch. Still, as directed by Annamaria Pileggi and cast with excellent local performers, this difficult but well-written play makes a thought-provoking impression. The play begins in the midst of a confrontation. In the stark, litter-strewn breakroom of the company where he works, Ray (John Pierson), a seemingly average office worker, has just seen someone he didn’t think he would ever see again. Una (Elizabeth Birkenmeier), hasn’t seen Ray for 15 years, but the last time they saw each other, he was 40 and she was 12. The nature of their earlier relationship is made clear fairly quickly, as is the fact that Ray served time for sexual relations with a minor. Since his release from prison, Ray has changed his name and started a new life, hoping to never be reminded of his past again, but Una has seen a picture of him with co-workers in a magazine, so she has tracked him down, and this confrontation ensues. What happens is understandably uncomfortable to watch, especially since the nature of their prior relationship is described in detail. The emotions are also on clear display, as both Ray and Una process their feelings about what happened, and about each other. I can’t really describe much else because it would give too much away, but essentially the play is one long, intense conversation. It’s a well-written, believable encounter, but that doesn’t make it any less disturbing, and to a degree, I wonder why the playwright would choose to explore such a relationship in such detail, although it does provide a showcase for the excellent actors here, and I suppose it shows the far-reaching impact of abuse in a direct, confrontational way. The performances here are extremely strong. The extremely conflicted dynamic between Pierson and Birkenmeier is intense and credible. Although Ray is a difficult character who has done something reprehensible, Pierson plays him in a way that makes him at least somewhat approachable, if not exactly understandible. He’s full of conflict and self-reproach, but also a clear measure of self-excusing. Birkenmeier especially portrays Una’s mixture of anger, hurt, loneliness, and conflict with intense veracity. There’s also a fine performance from Sienna Hahn in a brief appearance as a character listed in the program as “Girl”. The discomfort of the subject matter and the disturbing nature of the characters’ confrontation is reflected in Patrick Huber’s stark, grey set and sharp lighting. Costumer designer Teresa Doggett has outfitted the characters appropriately, as well. There’s also good work from props designer Jess Stamper and sound designer Pierson. The technical elements of this play aren’t flashy or obvious, but they provide just the right backdrop for the proceedings. As I’ve already noted, this is a difficult play. It shows a distressing, uncomfortable confrontation on a direct, human scale. Blackbird is definitely not for all audiences, but STLAS has done about as excellent a job with it as I can imagine. It’s a disturbing, challenging, thought-provoking experience. The first production of New Jewish Theatre’s 21st season is the stage adaptation of Mitch Albom’s popular book Tuesdays With Morrie. It’s a two-man show, bringing to the stage two excellent local actors, continuing NJT’s tradition of excellent casting. I hadn’t read the book or seen the play, and I’m glad this has been my introduction to it. The story is autobiographical, depicting the friendship between author and sportswriter Mitch Albom (Andrew Michael Neiman) and his former university professor, Morrie Schwartz (James Anthony). Mitch narrates the story, starting with how he first met and got to know Morrie at Brandeis University in the 1970s, but then lost touch after Mitch graduated and he threw himself into his career. After 16 years of no contact, Mitch finally sees Morrie on TV, being interviewed on Nightline. It’s through this program that Mitch learns of Morrie’s diagnosis with ALS, or Lou Gehrig’s Disease. Mitch then calls Morrie, who actually remembers him, and the phone call eventually leads to a visit, which becomes a series of visits in which Mitch gets reacquainted with Morrie as Morrie’s illness progresses. Over the course of a few months, Mitch and Morrie become close again, and Mitch learns a lot from Morrie about what really matters in life. We also see the devastating effects of Morrie’s condition, as the once energetic professor finds himself unable to perform basic everyday tasks, and Mitch has to help him more and more during his visits. It’s a vivid depiction of two men and their remarkable friendship as both of them learn to deal with issues of life, mortality, and priorities in different but highly personal ways. It’s a moving story already, but what really makes this production is the casting. Neiman and Anthony are both excellent in their roles, with Neiman convincingly portraying Mitch’s journey from a workaholic who buries his emotions in his job to being forced to care about Morrie and his situation and reconsider his own outlook on life. Anthony, especially, is superb as Morrie, an intelligent, witty, and vital man who has to come to terms with his own physical decline and his impending death. It’s a remarkable performance, achingly realistic as Morrie’s motor functions first falter, and then gradually fail, while Morrie still maintains his passion for life and his concern for Mitch and everyone else around him. The later scenes in the play may be difficult to watch, as Morrie’s decline is more and more evident, and as Neiman and Anthony portray the increasingly close friendship between these two men as the inevitable approaches. The production values here, as usual, are first-rate, with a detailed and imaginative set by Cristie Johnston that focuses on a large, leaning bookcase, and also effectively utilizes a turntable at a key point in the production. The sense of movement and passage of time is effectively achieved through the staging, as well. There’s also excellent work from lighting designer Michael Sullivan, costume designer Michele Friedman Siler, props master Sarah Azizo, and sound designer Amanda Werre, as all the technical elements work together to help bring the audience into Mitch and Morrie’s world. Tuesdays With Morrie is an emotional play, portraying a full range of feelings and moods from humor to drama to heartrending sadness, to ever-persistent hope, as personified by Morrie and his relationship with and influence on Mitch. It’s an expertly staged and acted production that’s likely to bring laughter as well as tears. It’s a thoroughly believable portrayal of a genuinely affectionate friendship, as well as the depiction of terminal illness and the process of grief. It’s another memorable production from New Jewish Theatre. Grey Gardens, the offbeat musical based on a cult-hit 1975 documentary about two reclusive relatives of Jackie Kennedy’s, is making its St. Louis debut with a presentation by the ambitious Max & Louie Productions. Although the source material was also made into an HBO movie in 2009, I don’t think audiences need to be familiar with the story to enjoy this stunning, memorable production. The top-notch production values, ideal casting, and thoughtful direction makes this a show that should intrigue audiences regardless of whether they have seen either of the films. I can make the above statement with some authority since, while I had heard of the films, I had never seen either before seeing this production. I had heard a few of the songs before, but aside from that and from knowing a little bit about the story on which the films and show are based, I went into this production with a fresh perspective, and I’m glad that this excellent production could be my introduction to the show. It’s the story of a mother and daughter–Jacqueline Kennedy’s aunt Edith Bouvier Beale and her daughter “Little Edie” Beale, who were at the height of New England society in the first part of the 20th Century, but by the 1970s had become reclusive and lived together surrounded by clutter and cats in their once-grand mansion, Grey Gardens, The show’s two acts show the audience their existence at two important eras of their lives, the 1940’s and the 1970s. Debby Lennon plays “big” Edith in the 1940s and older “Little” Edie in the 1970s, with Donna Weinsting playing “Big” Edith in the 70s and Madeline Purches playing the younger “Little” Edie in the 40s. It’s a depiction of these women’s close but volatile relationship and the eccentricities of both. In a way, this is almost two plays, although Act 2 is essentially dependent on Act 1 as background. Act 1 shows Edith Bouvier Beale in her prime, as she holds court in her palatial mansion planning an engagement party for Edie and her fiance’, Joseph Patrick Kennedy, Jr. (Will Bonfiglio), although despite her daughter’s wishes, Edith intends to make the party more of a concert with herself as the star, accompanied by her ever-present pianist, George Gould Shaw (Terry Meddows). While Edie and Joe hope for the future, Edith lives in a somewhat deluded version of the present, where her ever absent husband is just “too busy” to be around, although she clings to the hope that he will be there to attend the party. The future is also represented by Edith’s young nieces Jackie (Phoebe Desilets) and Lee (Carter Eiseman) who are encouraged to “Marry Well” and fit into society by their domineering grandfather, Edith’s father J.V. “Major” Bouvier (Tom Murray). All the grand plans don’t go entirely as planned, however, and the result of what happens is seen in Act 2, where the mother and daughter are still living in the shell of a mansion and “Little” Edie clearly resents being tied to her mother, who has turned her attentions to the cats and to a hippie-ish young man named Jerry (also Bonfiglio) while the ghosts of the 1940s characters remain as a chorus of echoes from the past. It’s a difficult play to describe, and I don’t want to say too much so as to spoil it, but there’s a lot to see here and this wonderful cast makes it fascinating to watch. The music ranges from more classical to more popular sounding songs, and the lead part of Act 1 Edith/Act 2 Little Edie is a demanding one, in terms of acting as well as musically. Fortunately, this production has the marvelous Debby Lennon, who gives a commanding performance, holding court as the imperious Edith in the 1940s and as the resentful, regretful, offbeat Little Edie of the 70s. There’s a suggestion of emotional/mental challenges for both women, although Edith seems much more assured in Act 1, trying to control the life of her only daughter, the excellent Purches as the desperately ambitious young Little Edie. In Act 2, when Lennon becomes the haunted, erratic older version of Little Edie, the superb Weinsting takes over as a sadder but not necessarily wiser Edith. 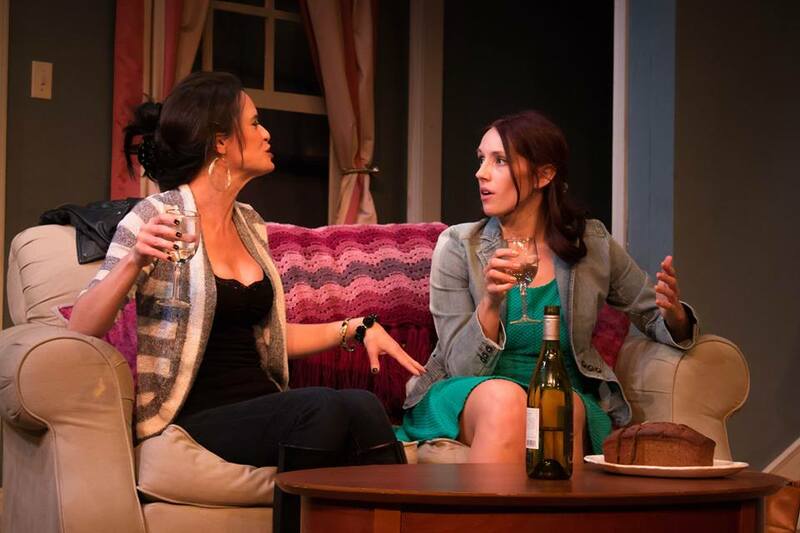 Mother and daughter in Act 2 have a caustic, if dependent, relationship, and this is expertly played by both actresses and staged well by director Annamaria Pileggi, as silence and deliberation becomes as important in communication as the speaking. There are also strong performances from Meddows as the jaded, snarky pianist Gould, Murray as the affable but domineering Major Bouvier, and Desilets and Eiseman in winning performances as the young Jackie and Lee Bouvier. Bonfiglio and Omega Jones are also memorable in dual roles–Bonfiglio as the ambitious Joe Kennedy and as the sweet slacker Jerry, and Jones as the Beale’s butler Brooks in the first act, and as his son the groundskeeper Brooks, Jr. in the second. The whole ensemble is excellent, working together well and presenting the material with clarity, ably supporting Lennon and Weinsting, whose performances are the anchor of this production. The production values here are first rate, with a meticulously detailed set by Dunsi Dai that allows is appropriately luxurious in the first act, and then dressed down in Act 2 to show the mansion’s state of disrepair. There are also colorful, ideally suited costumes by Jennifer JC Krajicek and hair and wig design by Emma Bruntrager , highlighting the high style of the rich elites in the first act, and reflecting more eccentric personal styles of the Edies in the second. Michael Sullivan’s lighting is used to excellent effect to help set the scene and tone of each era. The overall tone of this piece is melancholy, with shades of lost hope, regret, and emotional dependence. Still, these are truly formidable women regardless of their circumstances, and their story is vividly portrayed here. Max & Louie’s shows are always memorable, and this one is no exception. It’s an extraordinary work of theatre, not to be missed. Max & Louie Production is presenting Grey Gardens in the Wool Studio Theatre the JCC’s Staenberg Family Complex until December 23, 2015. Scene: a beautiful tropical island. An elegantly dressed man and woman stand on the beach, while the man gives a halting speech declaring his love for the woman. He proposes, and she accepts with great enthusiasm. He puts the ring on her finger, and they embrace. Cut! That’s a wrap! That may seem like the end of a story, but it’s just the beginning in Reality, a new comedy by Lia Romeo that examines life after the cameras stop rolling for the contestants of a Bachelor-like reality dating show. 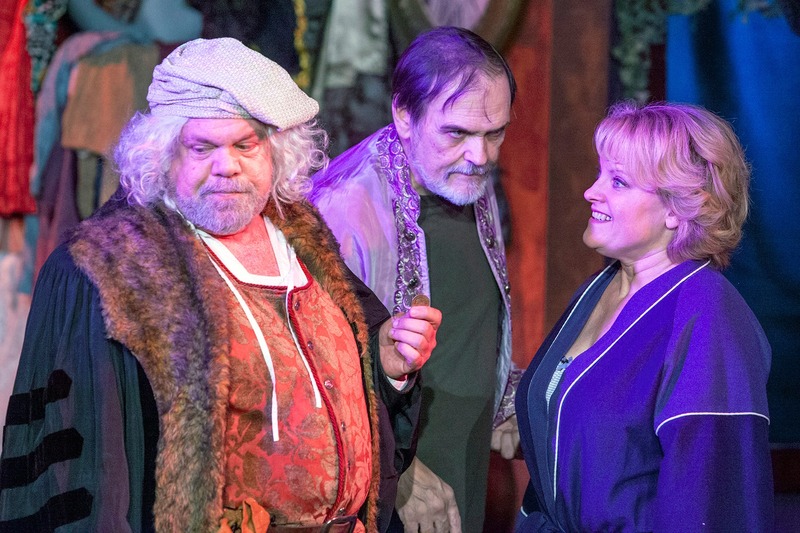 It’s an incisive, witty swansong for HotCity Theatre, a long-time fixture in the St. Louis theatre scene that will be closing its doors following this production. It will be sad to see HotCity go, but they’re certainly not going without humor. Reality is a new play that explores its subject matter with a clever premise, a well-structured plot, and well-drawn characters. It’s also inventively presented to look like the shooting of a television show. When Matt (Tyler Vickers) proposes to Annie (Maggie Conroy) while filming the last episode of the TV show Looking For Love, their “journey” isn’t over. As show producer Josh (Ben Nordstrom) informs them, they now have to keep their relationship quiet until the final episode airs. This is a complicated situation, as Matt and Annie are set up in a “safe house” away from prying eyes on the weekends so they can spend time together, although Annie quickly finds that Matt isn’t the kind of guy she thought he was, and Matt isn’t sure what he thinks of the relationship, Annie, or himself. Annie, who has dreamed of finding an ideal mate, is surprised to learn from runner-up contestant Krissandra (Julie Layton) that many of the show’s contestants were there for Hollywood exposure rather than to find love. While the relationship between Matt and Annie is tested, Josh is there as a confidant for Annie and becomes another complication, but is Josh being sincere or is he more concerned about the show? This is an intriguing show in its concept, which is very well realized by Director Annamaria Pileggi and the strong cast and crew. With a set designed by Kyra Bishop to resemble the set of a TV show, and Michael Sullivan’s lighting and Jane Sullivan’s costumes adding to the reality TV-style atmosphere, this play makes an impression with its consistent sense of theme. Even the scene changes are structured like those of a TV show, and when the actors leave the set, they are often visible getting ready for the next scene. Everything is out in the open here, unlike the situation for Annie, who is often in the dark as to what is happening around her. Conroy gives a convincing performance as the somewhat naive Annie, who is gradually learning that reality isn’t exactly what it seems. Vickers, as the amiable but somewhat clueless Matt, displays a convincingly awkward chemistry with Conroy. There’s also excellent work from Nordstrom as the sometimes charming, always scheming Josh, and by Layton as the brash Krissandra, who is probably the most honest character in the show. Her scenes with Conroy as the two drink wine and swap stories about what happened during filming are among the comic highlights of the production. The relationship dynamics are constantly shifting in this play, and the cast handles all the changes and surprises with energy and excellent timing. If you have watched any reality dating shows, the format of the fictional Looking For Love will be familiar. As extreme as the situations can get in this play, it’s not that difficult to imagine a similar situation happening behind the scenes of a TV show like this in real life. That sense of only slightly heightened reality adds to the entertainment value of this memorable comedy. 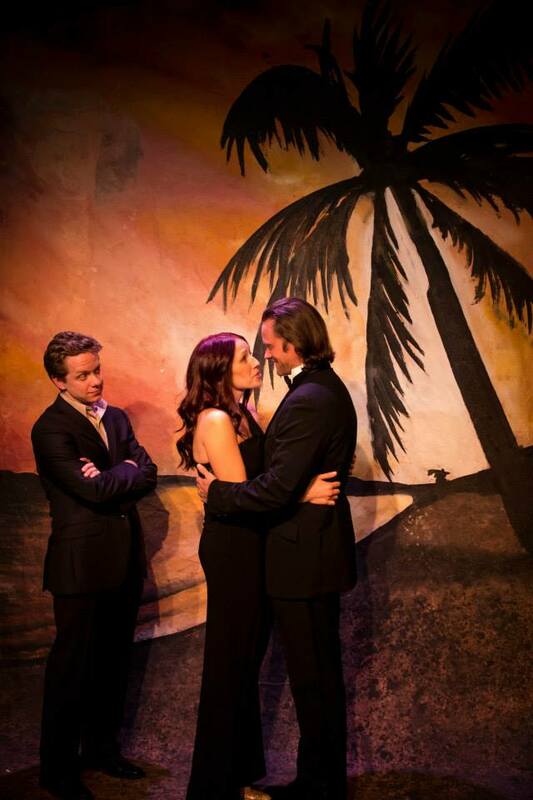 It’s another strong production from HotCity, a St. Louis theatre company that has will be missed very much. Rembrandt’s Gift is an intriguing little play. I say “little” because it’s surprisingly short and concise, and I say “intriguing” because it’s not easy to categorize. It’s a domestic drama, a comedy, and a fantasy all rolled into one, involving the famous 17th Century Dutch painter acting as a combination catalyst and counselor for a troubled present-day couple. It’s a fast-moving play with an interesting concept, and the biggest strength of Dramatic License Productions’ latest presentation is its excellent cast, along with some wonderful technical elements. The story takes place entirely in the cluttered New York City loft apartment of married couple Walter (John Contini) and Polly (Kim Furlow), who are dealing with a multitude of issues, including Walter’s OCD and hoarding, threats of eviction, and Polly’s regrets over the stagnation of her once-celebrated career as a photographer. Walter, once a successful actor, has become increasingly housebound and attached to his large, unwieldy collection of theatrical costumes and other memorabilia, and Polly is increasingly frustrated with his life-dominating rituals and his unwillingness to help her clean up the house in preparation for a meeting with their landlord. When an argument erupts surrounding Polly’s favorite framed self-portrait of Rembrandt, the two are shocked to find the painter himself (Greg Johnston) standing in their hallway, after having apparently been transported via a mirror on the wall. Rembrandt, who speaks in a style reminiscent of Shakespearean English, is understandably bewildered by his sudden arrival in 21st Century New York. Meanwhile, Polly–who seems to have had something of a historical crush on the painter–is thrilled, and Walter is suspicious. As Walter, Polly, and Rembrandt struggle to make sense of their situation, events transpire that challenge the strength of Walter and Polly’s marriage, as well as challenging all three to confront their own life goals, dreams and regrets. This is a very quickly paced play, with some witty dialogue and a lot of historical background. It’s obvious that playwright Tina Howe did a lot of research about Rembrandt’s life, and all three characters are richly drawn. There are a few surprises along the way as Rembrandt’s role in Walter’s and Polly’s lives evolves into something unexpected, and the conclusion is upbeat if a little bit simplistic. Still, the real strength of this play is in its characters, and they are ideally cast here with excellent local performers. Contini’s portrayal of Walter is especially noteworthy, in showing the full range of emotions of this proud, aging actor who is being forced to confront his own fears and limitations, as his sense of devotion to his beloved costume collection is contrasted with his devotion to his wife, with the surprising antagonist being the out-of-place Rembrandt. Johnston plays the painter with a charmingly baffled air and a sense of renewed wonder, as the transplanted artist is forced to discover a new world of sights, sounds and people. Both actors play well against one another, with an intense confrontation in the second act that includes a dynamic and at times hilarious sword fight choreographed by Erik Kuhn. Both also display strong chemistry with Furlow, whose wistful Polly is torn between her commitment to Walter and her star-struck enchantment with Rembrandt. All three performers do excellent work here, carrying the weight of the story on their shoulders and managing to maintain sympathy and energy. 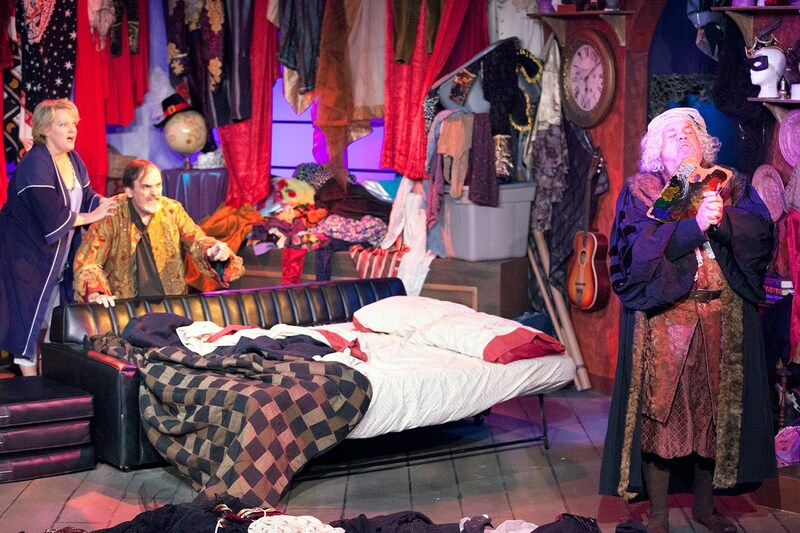 The technical elements are especially well done here, as the small performance space in Chesterfield Mall is transformed into a cluttered SoHo loft that looks like a cross between a theatrical costume shop and an attic. The set design, by Cameron Tesson, is richly detailed, as are the ideally suited costumes by Teresa Doggett. From Rembrandt’s robes to Walter’s conglomeration of theatrical garb, the costumes help create and maintain the tone of both confinement and whimsicality at the center of this story. There are also some fantastic lighting effects by lighting and sound designer Max Parilla. This is the kind of show in which the setting is almost a character in itself, and the production values are very impressive here. This is a play about relationships. It deals with a husband and wife’s relationships with one another, as well as artists with their fans and with their art. Although the story can be bit simplistic at times, it’s full of funny and poignant moments, as well as strong dialogue. Ultimately, Rembrandt’s Gift at Dramatic License is worth seeing for the quality of the physical production and, especially, the first-rate cast. It’s another great reminder of the sheer depth of talent in the St. Louis theatre community.